SHOOTING THE SHIZNIT : RassleResults: DCW Jonesboro, AR 2.27.10 - Ron Rage Returns To The Dogg House!! 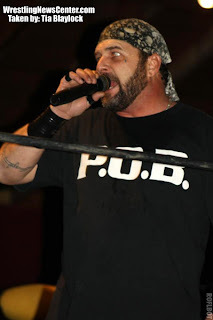 RassleResults: DCW Jonesboro, AR 2.27.10 - Ron Rage Returns To The Dogg House!! Show starts off with the the National Anthem like it does every week, but this week JB Hayes has purchased the DCW announce booth for the entire night and Casey Rinaldi and Jeff Perryman know nothing about it..Hayes says he is looking to expand JB Hayes Enterprises and wants to scout some talent! PokerFace's music hits and the DCW Champion comes down to the ring. He starts talking about every person in DCW he has beat and who he wants to face next, and since he has all the stroke around here it will not be JD Kerry, Southside Brawler, Mr. Pimptacular, then the Playaz music hits...Southside and Pimp come to the ring and Southside tells PokerFace to quit ducking and dodging him and to give him his shot...then Mr Pimptacular tells Southside, sorry bro you have had your chance, but I beat the champ last week and I want a shot tonite...Poker then tells Southside that he better get ready to wear a flea collar b/c tonite he has to go fight the Big Dogg, then he tells Pimp that he didnt beat him last b/c he still has the DCW title...then Ron McClarity comes to the ring! Ron says Poker I was listening to all those names you called off and man, my names was not on the list..I want a shot at the DCW Heavyweight Championship...Poker and Ron go back and forth until finally PokerFace agrees to the match tonite! Then Mike Anthony comes to the ring getting ready for his opponent and the music hits..it is someone who we have not seen in DCW in a long time..OMG its Ron Rage and the crowd goes crazy!! -match of the night candidate..Both guys looked amazing in the ring together! Both guys tried to one up each other with different moves and trying to go above and beyond! It was good to see Kerry back in the ring after all he has been through in the past months..Match went back and forth and neither guy could get the upper hand, but Kerry finally gets Pimp down and goes for his frog-splash, but misses and Pimp rolls Kerry up using his tights for the 1-2-3...winner via pinfall Mr Pimptacular!! Intermission-during intermission DCW usually gives some giveaways and sings Happy Birthday to anyone in the crowd if it is their birthday..this week was Drew Dogg's birthday, son of DCW Wrestler Rick Ruby, and a cake was brought out to him and he had Happy Birthday sung to him from everyone inside the arena, then Ron Rage's music hits...Ron comes out and tells everyone that a year ago tonite, he came in year and did something he has regreted everyday since..You do things in this business you are proud of and aren't proud of, and he attacked Rick and his son last year on his birthday..Ron gets down on one knee and appologizes to Drew and tells Rick man to man he is sorry..crowd goes crazy!! -match was good from start to finish..def a match of the night candidate! I have seen Rodney Mack wrestle in OVW, WWE, and ECW and I have never seen him booo'd like he is now! Match went back and forth with Mack and Southside trying to one up each other..Mack uses his mma background to try and ground Southside! Southside uses his speed and quickness to try and get things back on his side..but in the end, Rodney Mack leaves the ring and gets counted out...winner via count-out Southside!! People were really jeeering Mack tonite and he told them the whole night to piss off and SCREW THEM! -match was down right amazing..another match of the night candidate! Thes two really showed their veteran colors tonite, putting on a 40 minute match for the DCW Fans..Poker used speed and agility to his favor and McClarity used his technical skills and his 20 year plus experience to gain the upper hand at times..Both men looked really good in the ring, but McClarity climbs to the second rope and Rodney Mack comes out to distract him while PokerFace uses the title to hit McClarity and get the 1-2-3..winner via pinfall PokerFace!! GREAT Show tonite..one of the best top to bottom cards in DCW History! About 135 fans there tonite..Will be good to see where things go from here! !